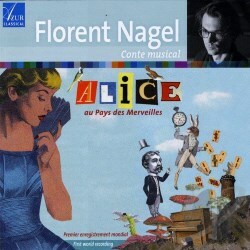 The composer Florent Nagel deserves an introduction. He was born in 1979 and studied at the Conservatory in Lille, France. Later he took tuition from Vladimir Soultanov at the Moscow Conservatory and Christine Sieffert-Marchais at the École Normale de Musique de Paris, picking up prizes along the way. He works as a composer, pianist and teacher, and I was interested to read that he has worked with children and adults with neurological disorders and elderly patients with Alzheimer’s disease. His Alice in Wonderland for piano four hands and one narrator "embodies a synthesis of his experiences on the stage and teaching, as well as his use of musical therapy". The novel Alice in Wonderland was written in 1865 by English mathematician Charles Lutwidge Dodgson under the pseudonym Lewis Carroll. It relates the story of the girl Alice falling through a rabbit-hole into a fantasy world populated by peculiar, anthropomorphic creatures. It has gained popularity both with adults as well as with children. Nagel himself writes: "The universe of Alice in Wonderland combines the symbolic, the imaginary and the real, the absurd and the logical, a multiplicity of senses." It is the composer’s aim for the audience to shape the experience and take from it what they will. "In Alice, the listener, the performer and the creator all become one." Yves Penay is outstanding. The clarity of his diction allows everything to be distinctly audible. He truly immerses himself in the part and his sensitive characterization of the narrative admirably brings this well-loved story to life. The two pianists have an instinctive feel for the ebb and flow of the storyline and deliver the richly graphic piano writing with infectious enthusiasm. Motoric and ostinato rhythms abound and percussive effects are scintillatingly achieved. Nagel’s colourful harmonies are adventurous and imaginative. His compositional ingenuity means the music perfectly matches the mood of the text, contouring its ebb and flow. The work benefits from the excellent sound quality achieved by the recording engineers, who have struck an ideal balance between piano and narrator. Apparently this is a live recording, but I was unable to ascertain the presence of any audience, and no applause is registered at the end. This superb release will be mainly geared towards French-speaking audiences. No text or translations are included, which is a pity. All concerned bring this imaginative score vividly to life.